Video: "My Career in Insurance Is..."
Have you considered a career in insurance? If you haven’t, then you’re possibly missing out on the opportunity of a lifetime! 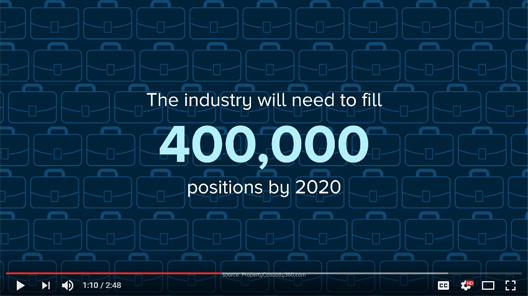 By the year 2020, the insurance industry will need to fill nearly 400,000 positions at all levels, and in all areas. Employment of insurance brokers and sales agents is expected to grow 9% by the year 2024 (compared with .5% overall growth during the same period ). Insurance careers span an incredible range of skills and talents—from actuaries and analysts to data scientists and marketers to drone pilots and engineers… and the list goes on. Insurance is the backbone of the global economy. Without insurers and the thousands of different professions in insurance, businesses wouldn’t be able to build factories and offices. Concerts, sporting events, the film industry, even universities, libraries, and parks—all are made possible in part by the careful management of risk—and that’s what insurance does: It makes great things happen. Working in insurance or one of the many related fields offers opportunities that extend far beyond the bottom line on your paystub, or the walls of your workplace. Whether you’re interested in serving your community, or experiencing different cultures around the world, or choosing a career path that offers real opportunities to grow and learn every day, a career in insurance can help bring your goals and dreams within reach. Amerisure Guideone Insurance The Hanover Insurance Group, Inc.
ARCH Horace Mann The Travelers Companies, Inc.